In my last video I made a mini box card, so today I have made a gift box for you to put it in. After we go to the effort to make a beautiful handmade card for someone it's nice to have something extra special to present it in. 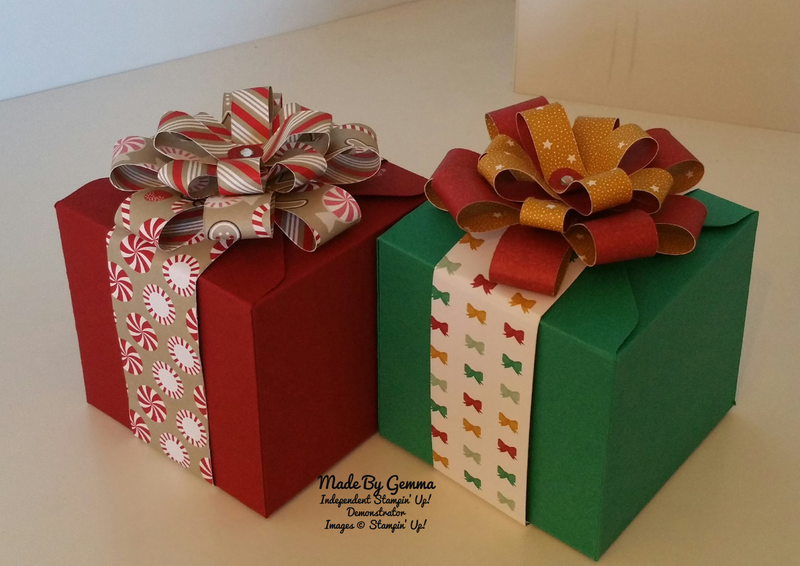 Here are the boxes, For the one on the right I have used Emerald Envy with the Presents and Pine cones papers and the one on the left matches the box card I made on the video. 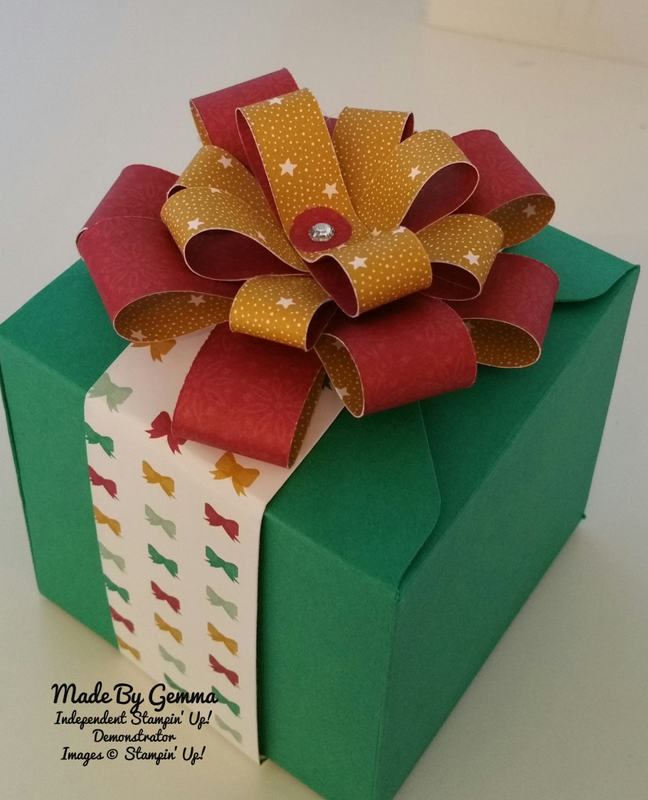 In today's video I have also shown you how to make the gift bow topper on the box which I have cased from Elaine Jackson at Papercraft Button, who sadly is no longer an active demonstrator with SU so thank you Elaine for the inspiration. 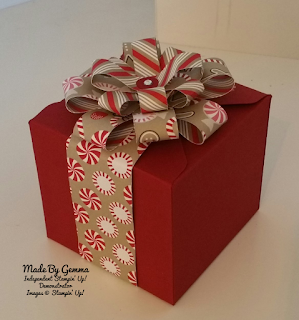 One piece of cardstock that is 10" by 10"
For the bellyband around the box a strip of patterned paper that is 15" by 1 1/2"
For the gift bow you will need 4 strips of patterned paper that are 3/4" by 7" and 4 strips that are 1/2" by 5". For the box, on your envelope punch board you need to line up your 10" by 10" cardstock at the 2 3/4" line and punch and score on all four sides, flip your card over and repeat. When putting your box together I recommend that you use a wet glue such as Tombow rather than double sided tape as it will give you a stronger box when dry. 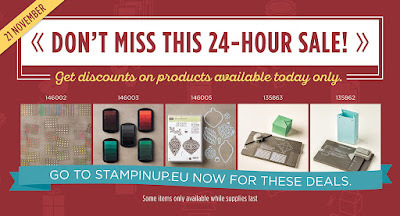 The Online Extravaganza happens only ONCE a year at Stampin'Up! You can get some great bundle deals and up to a huge 40% off selected products. This all starts on Monday 21st November and lasts for one week! Its a great chance to stock up on some crafty goodies. To make it even more exciting there will be 24hr sales on the first and last day of the extravaganza period so make sure you don't miss out. Here is a preview for the first day and the great deals available for one day only, click on the image below to view the pdf of the entire sale listing.